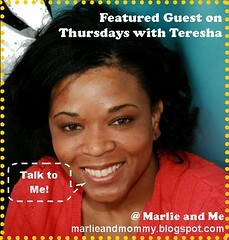 Marlie and Me: Thursdays with Teresha: Welcome to the Nut House! Blog Name: Welcome to the Nut House! What is your kid(s) favorite toy? Each girl still has their special "lovey"... Hannah's is a doll named Sally and Michaela's is a stuffed dog appropriately named Puppy! What was your favorite toy when you were a child? A stuffed elephant my dad gave to me when I was 5. His name is Elmer... and I still have him! What is your favorite season of the year and why? Hands down, my favorite season is fall. I love the cool, crisp weather... watching the leaves change color... and my birthday and wedding anniversary both just happen to occur in the fall! What's on the menu for Thanksgiving? The usual fare... turkey, ham, stuffing, mashed potatoes & gravy, sweet potato casserole, mac & cheese, green beans... and of course, lots of desserts! What was your family's holiday tradition when you were growing up? As far back as I can remember, my family opened presents on Christmas Eve. We'd attend the evening church service then go back home for a light supper. My parents would let my brother, sister and I open our stockings... and then it was back to church for the candlelight service. Since it was well after midnight by the time we got back home, we'd just change into our pajamas and open our gifts. Now that we're all grown, we still celebrate with my side of the family on Christmas Eve and spend Christmas day with my husband's family. What is a holiday tradition you've established with your own family? One thing we've started is on Christmas Eve, my mom reads a Christmas story to her grandkids... each year it's a different story. What is your lamest hobby? Ummmm... this is a hard question! I really don't have many hobbies... and I wouldn't call any of the ones I do have "lame"! I like to read, scrapbook... and blog, of course! Are you more attracted to hunks or geeks, and who is your perfect specimen? Another hard question! I'd say I'm equally attracted to hunks and geeks. Geeks (like Jim from "The Office") will always have a special place in my heart, but there's also nothing quite like a manly man. And my idea of the perfect male specimen? That would be my movie-boyfriend... Daniel Craig! Next week on Thursdays with Teresha...the perfect tonic for your Black Friday hang over! Just kidding! Look out for a new set of questions answered by yours truly and Shannon pick for the next featured guest.